Thank you for visiting my website! 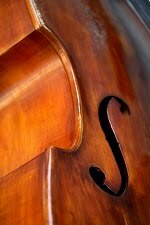 Music is my passion, and my life is dedicated to sharing my music through the violin. Whether you want to listen to clips of my music, find an outstanding violin instructor, learn about upcoming performances, or are simply curious about me, you are welcome to browse all the pages; they are listed on the left. We offer individual classes and audition/recital preparation workshops, with highest quality violin instruction in the area. Whether you or your child are new to the violin, or a more advanced student trying to get to the next level, or a violinist looking for performance coaching to reach your full potential, Stan will help you become the best violin player you can be. Stan's students have ranged from four-year old beginners and school-age students to music school teachers and symphony orchestra members. His high school students have gone on to bcome concertmasters in state youth orchestras, and have received scholarships to study music at prestigious conservatories. Most importantly, they all continue loving music and cherish their special connection to it. Stan's teaching philosophy combines various technical and physical fundamentals, advice on how to practice, and musical inspiration. The goal is to create in the mind of the students -- children and adults, amateurs and professionals -- a dynamic, a color, an articulation, and a mood. Then, the practicing becomes focused and techniques can be mastered and perfected. Stan's students experience wonderful results, achieving a relaxed, simple posture with the instrument, and quickly attaining a high level of playing. Luke, 9yo. My son Luke has started violin study with Mr. Antonévich for about one and half year. He is really lucky to start learning violin with Mr. Antonévich and progressed dramatically because of Mr. Antonévich's dedication to hard work, insistence on excellence and details, precise and effective instruction. 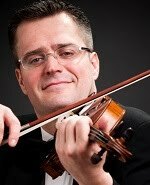 He is not only a violin artist, but also very experienced educator. After less than two years’ study with him, Luke has improved to advanced level with solid foundation of violin skill and good habit from beginner due to Mr. Antonévich’s strict and a great reputation in teaching. He can see the potential of each student and encourage them stretch themselves to farther than they think. We are so blessed to have such a wonderful teacher. Max, 13yo. I want to write a few words about Stan Antonevich, who is not only a world-famous violin virtuoso, but a fantastic violin teacher. 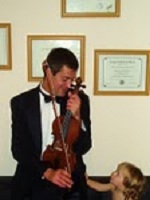 Our son Max has been studying with Stan for one year and during this relatively short period of time he has made tremendous progress both in the technique of violin playing and in musical performance. Stan generously shares all his knowledge and his soul with his students. Our son looks forward to every lesson, and seriously prepares for each lesson, because he greatly admires his teacher and wants to play like him some day. Why did we choose Stan? We had other options, but then we looked at some YouTube videos of musical works performed by Stan. His virtuoso emotional performance can not leave the audience indifferent. In his hands, the violin sings, cries, laughs. So our son became a pupil of Stan, and he is very proud of it. Subaiou, 24yo. I came to study with Stan to prepare for auditions to graduate programs in violin performance. At the time, I was uncertain of my place as a musician, and primarily sought technical guidance to align myself better with my immediate goals. To my astonishment, Stan is able to recognize a student’s potential beyond the student’s own comprehension. Through studying with Stan, my violin playing has been thoroughly transformed. Within a very short time frame, he has helped me achieve what I was not aware I could accomplish, both technically and musically . With Stan’s help, I successfully completed my auditions in the following winter and was accepted with high scholarships into all three graduate programs for which I auditioned. Stan has a striking ability to perceive the root of any problem, as a result his teaching is fundamental and intuitive thus remarkably effective. In his teaching and as a human being, Stan displays intense power, immense patience and incredible empathy all at the same time. It is impossible not to be affected by his contagious passion for music and life. Andrew, 10yo. Stan Antonevich has been an amazing teacher and caring mentor to our son. He takes great care in nurturing our son as an individual, student, and performer while sharing with him his incredible gifts as a master violinist. We feel extremely blessed to have this opportunity for our son. Alexandra, 11yo. My daughter started taking violin lessons with Mr. Antonevich after two years of studying with other violin instructors. After only two lessons, we were able to see a tremendous improvement in her violin skill. Her position has been corrected, which she was never able to accomplish in the previous two years. My daughter is happier because she can hear how much better she sounds now. As of this year, she has been selected as the first seat in the school orchestra. My daughter loves her violin lessons with Mr. Antonevich. Varghese, adult. I THANK Stan for all the support, encouragement, and wisdom he has shared with me. I am truly blessed and honestly, if not for him, I would have stopped playing violin a long time ago. When I see how motivated he is, and how positive he is about me, I am truly encouraged. 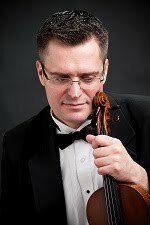 Peter Hughes, adult: I met Stan Antonevich when I was studying for my violin performance diploma at the Longy School of Music in 1998. Stan was definitely the best violinist at the school at the time. He heard me practicing one day and offered to help me. He would go to great lengths to help me improve my playing, would spare no effort to share with me what he knew. Stan opened many doors and windows in my playing; he was especially able to help me with my bowing in a way that was extremely easy to understand. In teaching me he was extremely honest but never uttered a word to discourage me—I myself was ten years his senior and a professional violinist at that. He is like that with all his students—encouraging and honest. I remember a four-year old student whose mother brought him on weekends to study with Stan, and I remember how very seriously he took his responsibility to teach this young boy. "He may be a great artist one day", Stan said, "I have to take great care in teaching him". 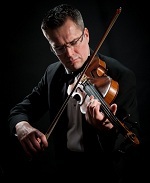 Stan’s gift consists of an enthusiasm and expertise for music and violin playing that he willingly shares with others. His teaching presents the technical aspect of playing as a means to the expressive aspect of playing. Anybody who has ever studied with Stan can undoubtedly attest to his mastery of the violin and his unique ability to teach what he knows. Cael Coventry, 6yo: Stan Antonevich taught my 6 year old son, Cael, for almost a year, and during that time he proved to be an excellent teacher. He obviously cares very much for music and in particular, the violin. Specifically, he spent a lot of time with my son paying close attention to detail, in terms of position of the violin, the bow and the hands and fingers. This enabled Cael to develop an awareness of the importance of these aspects of musical development. Regarding the actual playing of pieces of music, Stan helped Cael to play the pieces he learnt, so that Cael learnt them both very quickly and very well. Above all, Stan gives 100% of himself through his teaching, which made him a favourite with Cael. Students know when they have a teacher who really cares, and this is certainly very true in Stan's case. I would recommend him to anyone who wants to learn to play violin, and I am very grateful to him for instilling in my son a feeling for the instrument, and for music, which he will carry with him always. T. Seidler, 16 yo: My sixteen-year old daughter came to Mr. Antonevich as a fairly accomplished violin student who had already performed Kabalevsky, Kreisler, Viotti, and Bach -- as a young person who loved music but did not know where it was taking her. After her first lesson she remarked to me as we were leaving, "I've learned more in the last hour than I learned all of last year". In the months following this initial encounter with Mr. Antonevich, she made quantum leaps in ability, confidence, and dedication to her instrument. Her right and left hands improved dramatically, greatly enriching her sound, expanding her repertoire, and creating an entirely new relationship to the music she played. Indeed, every lesson became a combination of master class and inspirational session -- a generous feast of invaluable techniques, practice methods, and musical analysis. I attended many such lessons with my daughter during the two years she studied with Mr. Antonevich, and so I was able to observe him closely. These sessions led me to respect and appreciate him very highly, not only as an unusually gifted musician and teacher, but also as a wonderful human being. Mr. Antonevich has a great sense of humor, a genuine, self-deprecating manner, and a keen sense for his students' individual potential. He offers a highly unusual combination of professional ideals, musical abilities, and pedagogical skills, not to mention his infectious love of music. With Mr. Antonevich's help, my daughter moved quickly and confidently into the violin performance literature, willingly tackling difficult pieces that she had always loved but used to think were beyond her -- Mozart, Bach, Bruch, and Saint-Saens. Indeed, she looked forward to practicing, welcomed performance opportunities, entered competitions, and began looking at music as a career. The transformation in her musicality also affected other aspects of her life, helping her to mature as a person and to clarify her goals. In short, her interaction with Mr. Antonevich was truly rewarding and life-shaping. Aaron West, college student: Stan Antonevich used to be my instructor at WKU in Bowling Green, KY. I am currently located in Louisville, KY where I run a private studio of 11 students. I am also actively performing here in the local community. I want you to know that I was very fortunate to have had Stan as one of my instructors and that he has been and always will be a huge influence to my musical career. Thanks for all of valuable advice and techniques you have shared with me.